Microgaming just can’t seem to stop blowing us away when it comes to collaborations between blockbuster movie titles and online pokies. 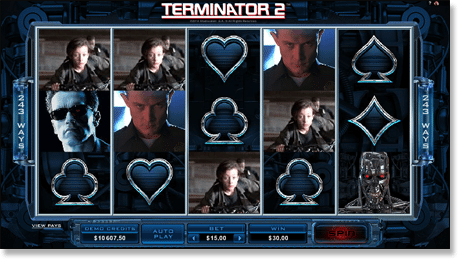 Along with partnerships that have brought Jurassic Park, Battlestar Galactica and Game of Thrones pokies into existence, it’s no surprise this leading software company landed the responsibility of bringing this classic Terminator II action movie into the world of online gambling. Released in 1991, Terminator 2 was revolutionary in its day, with visual effects that broke new ground in the movie industry. The film won four Academy Awards and made over $500 million worldwide, safeguarding its place in film history forever. Microgaming pay utmost respect to the quality and intensity of the movie, with stunning 3D graphics that will impress even the most die-hard Terminator fan. The Terminator 2 plot line, in very basic form, is the story of a machine on a mission to save humanity. The pokies version maintains the drama and excitement of the movie, with crystal clear HD graphics that use images of the real characters along with some robotic CGI. Symbols include Arnold Schwarzenegger (T-800), Linda Hamilton (Sarah Connor), Robert Patrick (T-1000) Edward Furlong (John Connor) and card suit symbols. Terminator 2 uses a five reel, 243-way pokies format which means each possible pay line is played per spin. Symbols can appear anywhere across the reels, in any order from left to right to form a winning sequence. Players don’t pick individual lines to bet and are automatically covered for all possible 243 winning combinations. Scatter Symbol = the orb symbol, this one’s literally impossible to miss as it displays the clear word ‘SCATTER’ on it. A winning scatter combination is complete when two or more scatters show up across the reels. Three scatters across the reels will activate the Free Spins bonus. The scatter can’t be substituted by the wild. Wild Symbol = the T2 movie symbol is the games wild and offers the chance for some big pay outs. The wild can substitute for any other symbol except the scatter and the T-100 symbol during Free Spins to complete winning combinations. Terminator 2 offers up some huge bonuses and also boasts the ridiculously high amount of 1,024 permanently enabled paylines during the Free Spins feature. T-800 Vision – this bonus is activated randomly at any point throughout the game and allows you to see things through the eyes of T-800. During this game any character symbols appearing on the reels are targeted and each pay a bonus win amount. If the scatter appears even once during T-800 Vision it will also activate the Free Spins feature. 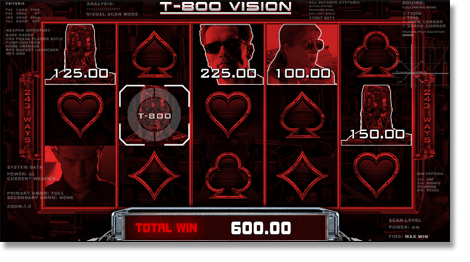 Free Spins – three or more scatters or one single scatter during T-800 Vision will enable Free Spins. Players are awarded 10 free spins with the possibility of the game going into Hot Mode, which will allow for an increased chance of wining. If the T-1000 symbols appears at any time during the Free Spins feature it will transform to complete the highest possible payout for that win. The game carries all the visual elements of the film, executed in flawless CGI, complete with a killer soundtrack and iconic scenes from the movie itself. Given the huge popularity of this game, it can be found at a range of online casinos for free play in practice mode or for real Australian cash. Our favourite venues to play Terminator 2 pokies game for free and real cash using AUD are listed in the casino table at the top of this page. Each of these sites offer some sweet welcome bonuses to new players, so why not take advantage of them all to increase your chances of real cash wins. With its sleek and beautiful design, Terminator 2 is a pleasure to play. Whether you are a fan of the movie or not, it’s impossible not to be impressed with Microgaming’s adaptation. The suspenseful music and detailed backdrop really add to the playing experience, while holding your breath for that tasty T-800 Vision bonus is worth the wait for some potentially big wins. Head to any of our recommended secure online casinos to try this awesome game for free or real money in Australian currency. Each of these sites offer new users a special welcome bonus to help increase chances of winning on the first visit, providing the perfect platform to take the Terminator 2 pokies game for a spin.